Mississauga, Oakville and Burlington expanded mightily in the decades following World War II as both the car industry and two major fuel refineries took root in the region. 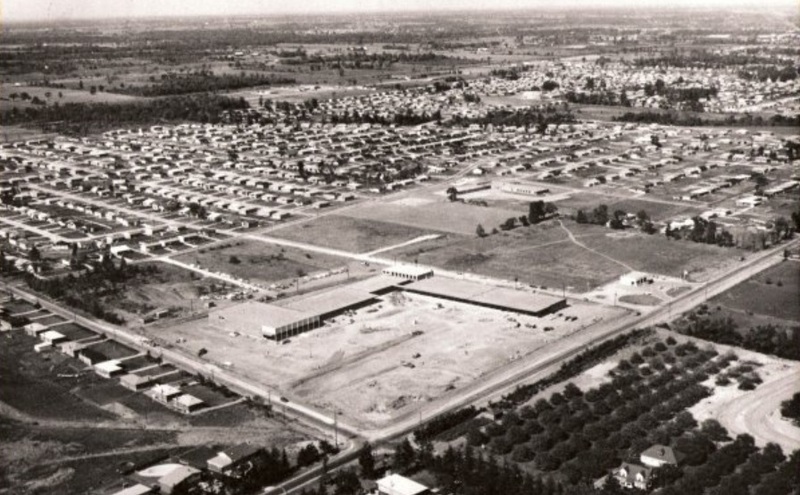 Ford Motors opened their first car plant here in 1953, and this factory produced nearly all of Ford’s vehicles in Canada until 1966. In 1962, the town of Oakville merged with neighbouring villages Bronte, Palermo, and Sheridan to become the new Town of Oakville. For the many years after that there was waves of houses built as farmers sold their fields and whole new streets and subdivisions appeared on the map. One of my favourite historical photos is online at Images Ontario, and shows the neat little rows of uncomplicated houses around the subdivision being built around the Hopedale Mall. Located in the Hopedale district of Bronte at Third Line and Rebecca Street, the Hopedale Mall was first built as an open strip mall in 1959, alongside the development of the surrounding subdivision. In 1971, it was enclosed and became Hopedale Mall as we know it today. Back in the nineteen seventies, I can remember driving with my dad and my brother past farmers’ fields that were being bulldozed and their farmland developed for houses. “This is the last crop these fields will grow,’ my dad would say as we drove past. Years later, I returned to some of these houses as a teenager visiting friends, or at house parties and never really noticed how uncomfortable their interior layouts were until now, when I’ve made it my livelihood to improve them. Forty years ago, the lot sizes were bigger, but the houses were almost invariably side split designs which put bedrooms above two car garages and kitchens beside living rooms and dining rooms (two separate rooms) on the other side of the dwelling. The stairs are in the center of the house, effectively separating all four levels. 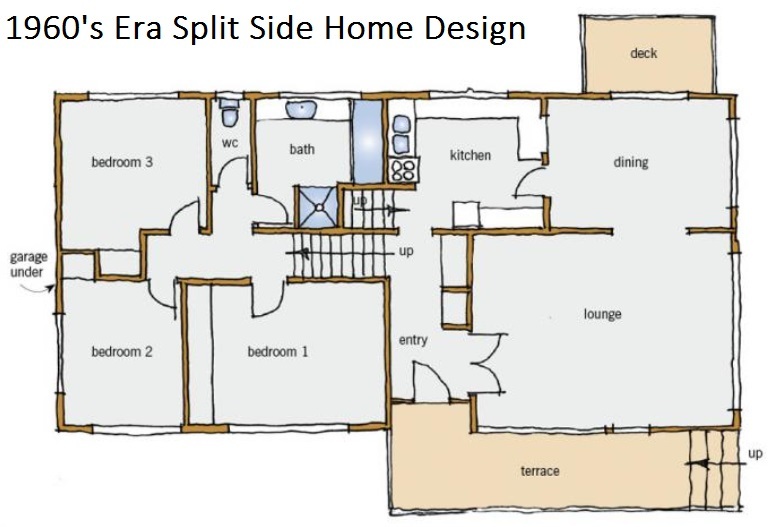 Designs like the one you see above were considered very innovative as previous layouts were more cubic and the garage was a separate building outside the domicile. Inside these economically sensible houses, the boxy little rooms were often stuffed full of the family’s Old World furnishings which usually left very little space in which the occupants could move around. After the first walk around to sniff out any infestations, subsidence or heave, dampness, or drainage issues, the experienced home renovator seeks to optimize the property’s natural advantages. The path of the sun overhead, the way the driveway meets the curb, the lot size and dimensions all factor into positioning the new kitchen layout in the improved (expanded) floor plan, and from this central room, open and inviting, all the other living spaces are connected. Unnecessary walls are erased and central stairways moved to one side as home additions expand the shell. New windows that are larger and better insulated are installed to let more light into the structure. Where you see a kitchen island today in what you know to be an historic home, you can safely conclude there was once walls and a table occupying the same spot when the building was first constructed. The house has been renovated and the kitchen remodeled. With or without sinks, kitchen islands can double the available counter-top space and offer more storage space underneath and overhead with racks for pots and pans. Modern home designers often put recycling receptacles and appliances underneath these granite top platforms, but the biggest advantages come from creating a clean and bright ‘project center’ on the top surface. Comfortable stools or highchairs makes the counter a mini stage for cuisine arts and school homework. Basement renovations, whether done separately or as part of an overall home renovation can literally improve the health of all occupants by improving the quality of the air they breathe. By addressing a natural phenomenon called the Stack Effect, a name given for how air moves upwards in a modern home, renovators can improve heating and air quality. When air is heated, it naturally rises, and in and older home the air intake may be pumping millions of dust and mold particles throughout the heating duct system. Eastview Homes is careful to select new basement walls, ceiling tiles, and basement flooring that are more resistant to mold and moisture. 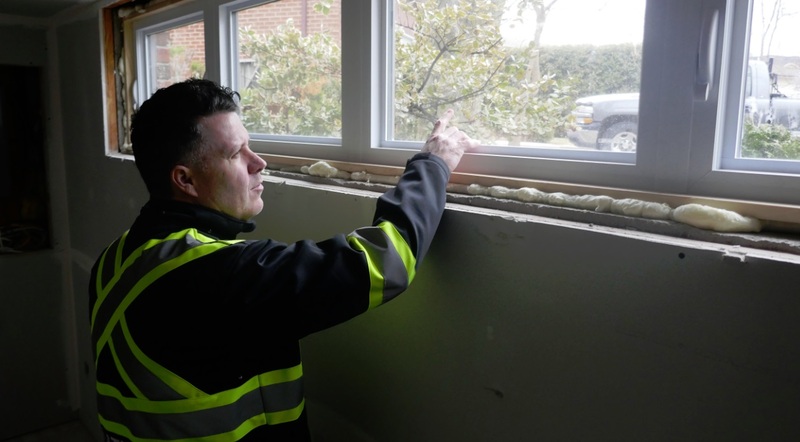 Plied with a myriad of government rebates and green home incentives, Ontario homeowners have been upgrading their windows and furnaces by the truckload since 1999. Modern windows are two ply with argon gas filling the space between the panes. New windows also play a part in creating an entire heat envelope around the home. Smart thermostats are another key ingredient in the mix. Homeowners don’t even have to be present to realize saving as they can control temperature adjustments using smart phones. The system learns when it can cool down houses and make savings. Gas fireplaces become the focal points of the wide open living rooms; there is usually a flat screen television above the fireplace which would be unheard of just a two decades ago. Gas heating solutions provide better quality heat and are cheaper and safer than electric baseboard heaters. Better furnaces can lead to big savings in home heating bills and there is no better time to make the switch then when the house is empty during renovations. Below is a photo of Keith Travers showing a mid efficiency furnace that is slated for removal and replacement. 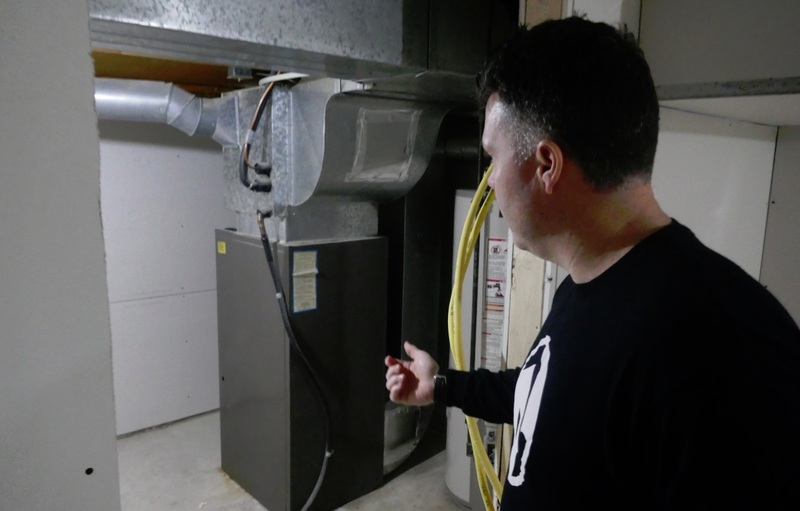 Keith points to a 40yr-old mid efficiency furnace that’s being replaced with a newer high efficiency model. High-efficiency furnaces, also known as condensing gas furnaces include a secondary heat exchanger that extracts some of the energy from the exhaust gases that are normally lost up the chimney with a mid-efficiency model. Rather than venting out the chimney, condensing furnaces vent horizontally through the wall. In some cases, it can be difficult to find sufficient clearance from windows, doors and gas meters on adjacent exterior walls, forcing installers to cut through floors and interior walls to run the PVC piping to the outside. 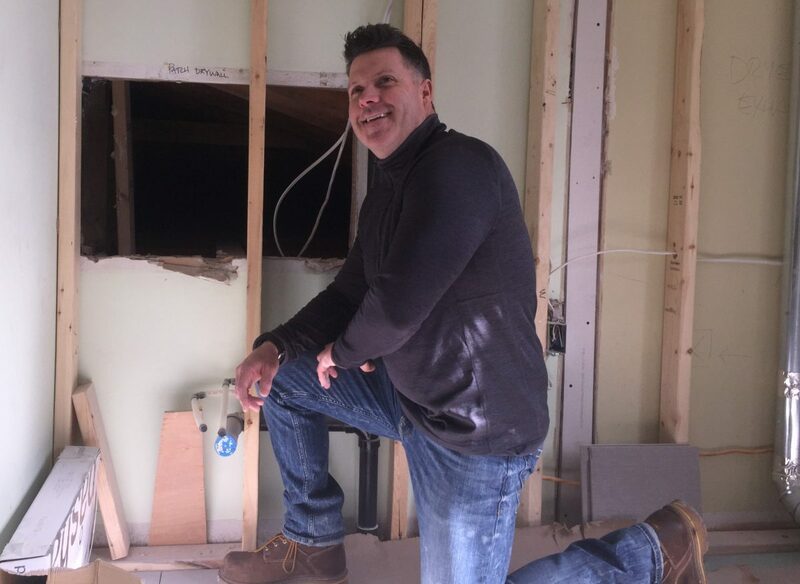 When renovating 1960’s era Oakville homes, Keith is constantly surprised during the demolition phase that always precedes the rebuilding, when his crew uncover nooks and crannies that were never insulated. This is especially true of houses that were built all at once in Oakville and Burlington subdivisions. Before the energy crisis of the 1970’s, energy was abundant and cheap in Canada and it was probably cheaper to heat your house than it was to properly insulate it. Also back in those days, spray foam insulation had not yet been invented. When professionally installed, specifically in the attic and roof, spray foam insulation will block airflow, control moisture, and insulate at a very high R-Value – all in one application. When installed throughout an attic, spray foam covers the space with a thick, dense “envelope”. Everything is completely covered – the attic support beams; the electrical wiring; the heating and return ducts; and all of the cracks and crevices that surround. With spray foam, the finished space is fully airtight, moisture-proof, and insulated with a very high R-Value rating per installed inch.